Utilizing our own processing technology including dewelry® (water repellent processing), it is a high quality product manufactured and sewn in Japan. 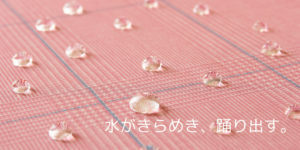 Super water repellent Furoshiki “Nagare” Water repellent finish “dewelry®” is applied, it is an evolved wrapping cloth that surprisingly repels water. Water dancer products is the brand of water repellant product to be enriches our lives with water repellent processing.